The Active Transportation Rail to River Corridor Project – spanning approximately 10 miles – will convert an existing, underutilized railroad right-of-way (ROW) into a multi-purpose pedestrian and bicycle transportation corridor on the western end of the corridor and create connections to the Los Angeles River on the eastern end of the corridor. The Project will provide a pedestrian and bicycle corridor that will connect the Cities of Los Angeles, Inglewood, Huntington Park, Vernon, Maywood, Bell, and parts of unincorporated Los Angeles County. The Project area is largely composed of a mix of high-density neighborhoods, commercial centers and industrial uses. The Project will provide an active transportation facility that will connect residents and workers to transit, jobs, schools, shopping districts, and parks. By transforming a former rail line and connecting it to the LA River, Metro will also enhance the regional bicycle network. In 2012, the Metro Board of Directors (Metro Board) requested staff to assess the feasibility of repurposing the Local North Section of the Metro-owned Harbor Subdivision rail right-of-way (ROW) as an active transportation corridor. The resulting Rail to River Intermediate Active Transportation Corridor Feasibility Study (Feasibility Study) in 2014 indicated that a bike and pedestrian path along the Project corridor would provide significant enhancements to the regional transportation network, while creating innovative environmental, economic, and mobility benefits for the surrounding communities. 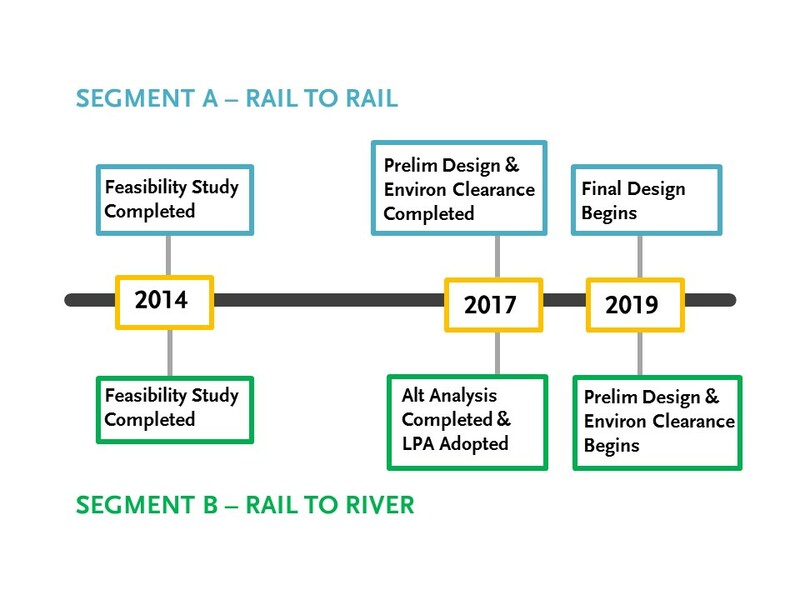 In October 2014, the Metro Board approved funding for environmental clearance, design, and outreach for Segment A as well as the Alternative Analysis for Segment B. Currently, pedestrians and bicyclists travel along the Project corridor with very few no facilities to support their travel patterns. Safe, comfortable, and convenient access for existing bicycle and pedestrian volumes is significantly impeded by restricted amenities on the south side of Slauson Avenue, with narrow and over-crowded sidewalks. On the north side of Slauson Avenue (location of the Project ROW), sidewalks are non-existent, creating inadequate passage for all users, including bus rider access to multiple bus stops along the Project corridor. The 2014 Feasibility Study generated a high level of interest from members of various communities and received attention from local and regional media news sources. The Project receives strong support from local jurisdictions, community organizations, and elected officials, because it promotes improved traveling conditions, encourages utilization of mass transit, and provides opportunities for upward mobility in underserved areas. The improved connectivity of public transportation networks will provide local residents with more transportation choices by connecting to the Metro Blue Line, Silver Line (I-110 Harbor Freeway Transit Way), and the future Crenshaw/LAX LRT Line. The Harbor Subdivision rail right-of-way has been underutilized for many years, but this project will support many local and regional planning efforts (such as Metro’s First Mile Last Mile Strategic Plan, Complete Streets, and 2012-2035 Regional Transportation Plan and Sustainable Community Strategies) to improve the quality of life in Los Angeles County. The project development process follows two project timelines, one for Segment A and one for Segment B. These timelines are separate because each segment is in a different stage of development. Segment A, which stretches from the future Metro Crenshaw/LAX Line Fairview Heights Station to the Metro Blue Line Slauson Station, has completed the environmental clearance and initial design phase. The project is currently preparing to enter into the final design/engineering and construction phases. 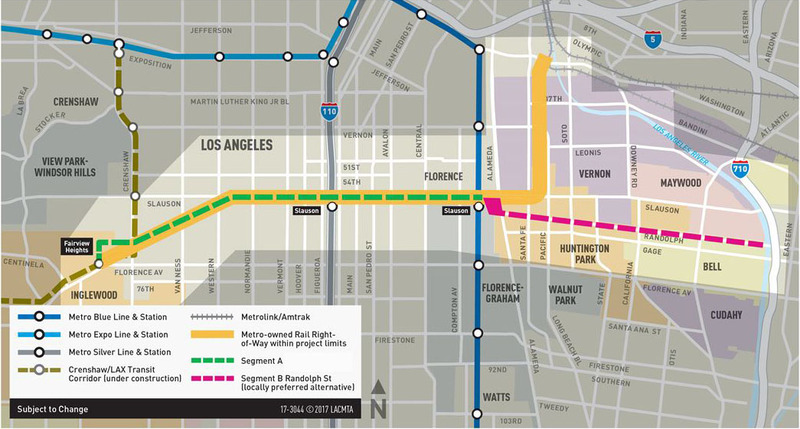 Segment B extends the corridor further from the Metro Blue Line Slauson Station to the Los Angeles River on the eastern-end along Randolph Street. In March 2017, Metro completed the Alternative Analysis and identified Randolph Street as the Locally Preferred Alternative. Segment B is entering the environmental clearance and preliminary engineering phase. Public input is valuable and welcomed! You are strongly encouraged to attend the series of Metro-hosted community meetings for the Active Transportation Rail to River Corridor Project. Each meeting will provide the public with opportunities to comment and ask questions at various stages throughout the process. Follow this page for meeting updates.